Red wine reductions make delicious sauces for all types of meats, including chicken, beef, pork, game meats, and lamb. The sauce itself is quite easy to make and very versatile. You can add deeper flavors to the red wine reduction by making it in the pan with the drippings from the meat you just cooked or you can make it by itself in its own saucepan. A basic red wine reduction involves a few simple ingredients. You can add additional herbs and spices to change the flavor profile. In a medium-sized sauté pan, heat the olive oil over medium-high heat until it shimmers. Add the shallots and cook, stirring occasionally, until soft, about five minutes. Add the red wine, stock, and thyme. Bring the mixture to a simmer and then reduce the heat to medium-low. Use caution when adding any alcohol to a hot pan. 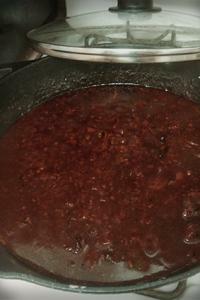 Continue to simmer until the mixture takes on a syrup like texture, 25 to 30 minutes. Whisk in the butter, one piece at a time, until the butter is melted. Press the sauce through a fine mesh sieve to create a smooth texture. Serve spooned over meat or vegetables. Different wines impart different flavors to red wine reduction. It's best to use a dry red wine. This is because reducing concentrates the sugars, and if you use a sweet red wine, the sauce will become quite sweet as it reduces. The most commonly used wines in these types of reductions are Bordeaux varietals, which contain blends or single varietals such as Cabernet Sauvignon and Merlot. Merlot will add soft, plummy flavors to the dish while Cabernet Sauvignon will add deep cherry flavors. Because these wines tend to be fairly tannic, they work well with very fatty cuts of meat like ribeye or New York steak, or beef short ribs, because the tannins cut through the fat. Syrah wine adds fruiter, jammier flavors along with a little spice. These wines often add berry notes to dishes, and will work well with gamey meats like lamb or venison. Zinfandel wine brings notes of spices to the reduction. It works well with boldly flavored meats such as beef tenderloin. Pinot Noir (and Burgundy wines from France) have delicate, earthy flavors. They work well with poultry, pork, rack of lamb, salmon, and mushroom dishes. Grenache and other Rhone varietal wines add a distinct smokiness to dishes. This sauce will work well with smoked meats, as well as with meats like pork tenderloin, prime rib, leg of lamb, turkey, and duck. You can vary the basic recipe in multiple ways. Reduce the wine in the pan with which you browned the meat, using pan drippings in place of olive oil. Scrape all the browned bits from the bottom of the pan with the side of the spoon for best flavor. Replace the thyme with either chopped fresh tarragon or chopped rosemary. Replace the olive oil with bacon grease for a smokier flavor or with duck fat for a richer flavor. Add a minced clove of garlic after the shallots have sautéed and cook, stirring constantly, for 30 seconds, until the garlic is fragrant. Then, continue with the recipe as noted. Add a teaspoon of heavy cream after you have incorporated the butter to keep the sauce from breaking. Red wine reductions are so easy to make, but they can take your cooking to the next level. They also provide a refined alternative to gravy. Try making a red wine reduction the next time you serve your favorite protein.